The internet is really good at bringing together communities of like-minded people. Like furries. And dendrophiliacs. And even book-lovers! In fact, there are sites out there dedicated specifically to hooking people up with new reading material through the power of social networking. And if you’re an author with a book to sell, it’s imperative that you utilize these sites. When we last spoke, I told you that if you wanted to successfully market yourself, you needed accounts on Twitter, Facebook, and Google+. Book publishers don’t give you a whole lot of support in marketing, because the advent of social media has made it free and easy, which means it’s mostly on you. Now we're going deeper down the rabbit hole. Over at Novel Publicity, we’re constantly impressing on people how important it is to establish profiles and engage readers on sites like Goodreads, Shelfari, weRead, and LibraryThing. This is not a polite suggestion. If you’re marketing your book(s) and don’t have profiles on these sites, then you are doing it wrong. When you go to these sites, first you create a profile page. Then you start building out your collection of books. From there you can review them, rate them, generally tell the world what you think about them. You can also find friends, or even just people who share the same interests as you. Once you start making friends, you can join discussions, trade recommendations, and generally enjoy the company of some well-read people. And when you're an author, it's even more handy: You can promote events, post videos, and offer exclusive content. Goodreads is my favorite of the four here. It’s comprehensive and offers a lot of great options. Start-up is a breeze and it’ll even comb through your e-mail, Twitter, and Facebook to see which of your friends are already members, which is great, because privacy is overrated. After creating your own profile and finding some friends to start, you can manually upload your book (if it’s not there already), and then create an Author Profile, which is merged with your regular profile. LibraryThing is useful if you’re OCD about your book collection. It combs through the Library of Congress, all five national Amazon sites, and more than 690 world libraries to populate its data. You can catalogue up to 200 of your books on a free account, but any more than that will cost you. This site is much more about book collecting and cataloguing, and discourages blatant advertising. While they frown on unsolicited requests for reviews, that doesn’t mean you can’t join the party: You can establish yourself as an official LibraryThing author. 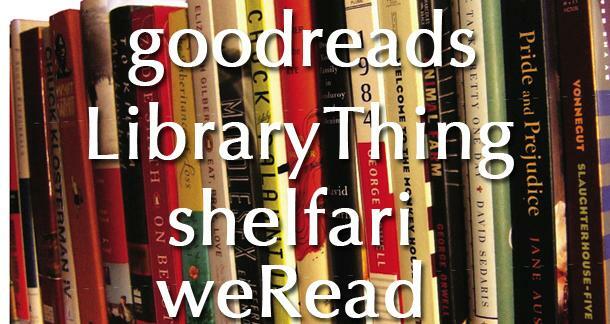 weRead is like a cross between Facebook and Goodreads. Lots of similar functionality from both sites, with a strong focus on finding and developing friendships. It’s not my favorite, but it’s a nice enough site and worth the time to set yourself up. Also, the site is glitchy, and if you know that going in, it might cut down on the frustration. Shelfari might be the easiest of the four to set up—if you have an Amazon account. Shelfari is actually owned by Amazon, and you sign in using your Amazon profile. And once you sign in, it automatically populates your bookshelf with past Amazon purchases, both physical and digital. The only downside is that they do not support authors whose books are not available on Amazon, but if your book isn’t available on Amazon, you have much bigger problems. Also, you don’t own your ‘author’ page, in the sense that anyone can edit it. But it’ll also notify you if any changes have been made, so that’s nice. Now, here’s the trick with these sites (and with all social networking sites, in general): You need to interact with people. Write reviews. Join discussions. Talk to people. Be witty. Be funny. Be informative. Most importantly, be accessible. These sites are communities, and they offer you fantastic opportunities to find readers and to promote your work, but even more than that, to build relationships. You don't need to be published to join these sites. In fact, if you're waiting until you're published to join them, you're going to have to make up some ground. Being visible and establishing yourself as an all-around cool cat will pay off in spades when you finally land that contract and your book is in print. And anyway, if you're a writer, you should also be a voracious reader, which means this is really where you should be spending your online time. Because, c'mon, admit, your Facebook friends are a little lame. This is by no means a comprehensive list. There are other sites out there that will help you career. For example, you're reading this article on the coolest writing website in the history of the entire internets (and we have classes and snarky news items, which Goodreads doesn't). But if you know of other sites that are really valuable, tell us about it in the comments. Tell us what you get out of it and why it's worth our time. Though, these are the heavy-hitters, and if you’re trying to market yourself, this is a very good place to start. You need to interact with people. Write reviews. Join discussions. Talk to people. Be witty. Be funny. Be informative. Most importantly, be accessible. I don't think you can stress that enough. I can't even tell you how many times these new authors simply drop into discussions or groups regarding other authors simply to plug their own books. When the first post is a "buy my book" post, that's just going to come off as spam. So yeah, get involved. If all you do is drop links to your book and then leave the discussion, it's pretty obvious what your intentions are. Thanks for the info, Rob! Will be interesting to put this to use and see what happens! Nice article. Goodreads is the only one I knew of! Ya sold me. Now at Goodreads.com under, what else, EricWojo. See ya there.